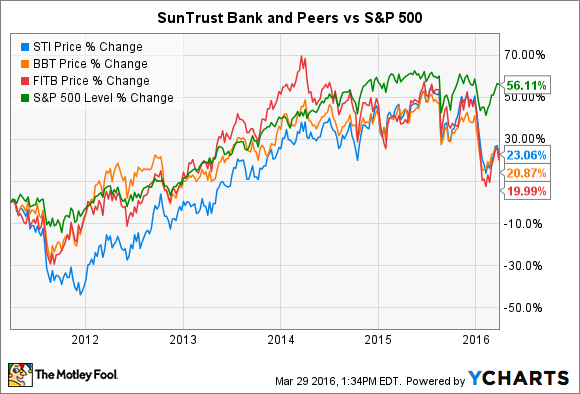 What Will It Take for SunTrust Bank Stock to Skyrocket This Year? What's dragging this large regional bank stock behind the rest of the market? And what will it take to break free? Year to date, SunTrust Banks (NYSE:STI) stock is down 16.5%. It's down about 12% over the past 12 months and has risen less than half as much as the S&P 500 over the past five years. In other words, the bank's stock has been hammered pretty bad. What will it take for the stock to turn itself around and rocket higher? To me, it's going to take aggressive changes to improve the bank's unimpressive financial performance. For large regional banks like SunTrust, the operating environment over the past few years has been tough. Banks of similar size, like Fifth Third Bancorp (NASDAQ:FITB) and BB&T (NYSE:BBT), have struggled to find efficiencies, growth, and earnings just like SunTrust. *Industry average efficiency ratio, ROA, and ROE for U.S. banks with more than $10 billion in total assets, sourced from the FDIC's fourth quarter 2015 Quarterly Banking Profile. All other data from sample of 59 large banks, data provided by S&P Capital IQ. Fifth Third's return-on equity-performance is inflated above the bank's actual core operating performance because of an equity investment in the payment processing company Vantiv. Fifth Third owns approximately $1.5 billion in Vantiv stock, which it is gradually selling off over the next few years. In 2015, the bank benefited from a gain of $419 million from these stock sales, about 25% of its overall earnings in the year. Adjusting that gain out, its return on equity was slightly above the industry average. By these measures, these three banks have been average performers compared with the rest of the industry. The market recognizes this, which explains why each has trailed the S&P 500 over the past five years, one year, and year to date. SunTrust reported total assets of $191 billion as of the end of the fourth quarter. BB&T reported $210 billion, and Fifth Third came in at $141 billion. In each case, these banks are quite large, but not nearly as large as the multitrillion-dollar megabanks at the top end of the industry. They're too big to avoid new post-financial crisis regulatory requirements but too small to fully absorb those costs with scale. All of the other challenges facing the industry are applied equally to banks of this size, increased capital requirements, low interest rates, the troubled energy sector, and so on, but they also shoulder the burden of big bank regulatory supervision without mega bank scale. On the other end of the competitive landscape, smaller regional banks face less regulatory cost, leading to better cost structures and an easier path to above-average earnings. The market recognizes this challenge, giving these banks very low valuations. Of these three, only BB&T currently trades above its book value, and it manages that by just a hair. BB&T's performance numbers are not all that different from SunTrust or Fifth Third's, but it still commands a materially higher valuation relative to book value. Why? Because BB&T has been more aggressive in making strategic deals to drive the franchise forward in spite of the tough operating environment. In 2015, BB&T completed the acquisition of the $1.9 billion Bank of Kentucky. That was quickly followed by its largest acquisition ever, buying the $18.7 billion Susquehanna Bank. These bets won't pay off immediately, but over time they should fill in strategic gaps in the bank's footprint, add valuable deposits to its core funding base, and increase earning assets. These actions can drive significant shareholder value over the long term. Yes, the operating environment is challenging for large regional banks. However, that is no excuse for inaction. BB&T recognizes this and has acted boldly. 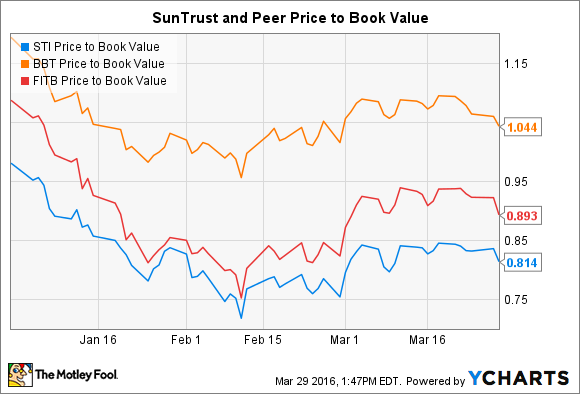 SunTrust, on the other hand, has made no significant strategic moves. So what is it going to take for SunTrust's stock to skyrocket? "For 2016, we're targeting revenue growth that exceeds expense growth and, thus, a tangible efficiency ratio that improves. That being said, the pace of improvement will be significantly lower than previous years as our core expenses have already declined substantially, and the operating environment, while improving in certain areas, remains challenging overall." In other words, he is saying that the company wants to bring in more revenue with less expenses, but he doesn't really think that it will actually happen. These kinds of statements, and the management attitude that creates them, do not bode well for the stock. Put simply, SunTrust must take meaningful action to improve its earnings for the stock to skyrocket. That means new cost management initiatives. It means pushing hard to compete and grow the business in its existing markets. It also could mean finding new markets, bolt-on acquisition opportunities, and other strategic methods to drive growth and earnings per share. It means being aggressive and taking action. That at least could raise the company's valuation relative to book value to a level commensurate with its more aggressive competitors, like BB&T. However, based on management's words and the company's recent history, this looks to me to be a long shot.